Sgt. 1st Class Peter Tycz II was born in Cheektowaga, NY and graduated from Tonowanda High School in June 1988. 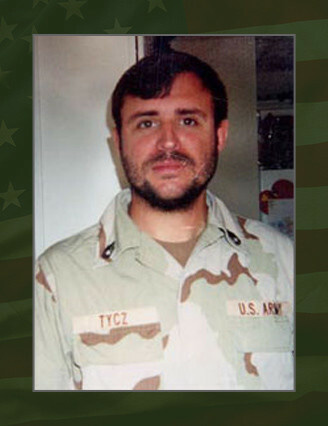 SFC Tycz’ awards include the Bronze Star for valor, Purple Heart, Meritorious Service Medal, Army Commendation Medal, Army Achievement Medal (with 10 Oak Leaf Clusters), Good Conduct Medal (with 4th award), National Defense Service Medal (with star), Southwest Asia Service Medal, Army Service Ribbon, Overseas Service Ribbon and the NATO Medal. He also earned the Combat Medical Badge, the Special Forces Tab, the Parachutist Badge and Dominican Republic Jump Wings.